Posted on Tue, Apr 10, 2012 : 5 a.m.
Hermann Ebbinghaus, a German psychologist who pioneered the study of memory, said, "Mental events are not passive happenings but the acts of a subject." This week we are looking at mental events of subjects -- players -- on defense: when to be active and positively try to establish and win tricks, and when to be passive -- sitting back and waiting for tricks to fall into your lap. The first indication that you should be passive comes when the opponents have struggled to get to their contract, squeezing every ounce out of their cards -- as in this deal. What should West lead against four spades? South opened one spade. North raised to two spades. South paused, consulted the cracks on the ceiling and then bid three spades. North also paused, not liking his 4-3-3-3 distribution, then shrugged his shoulders and bid four spades. 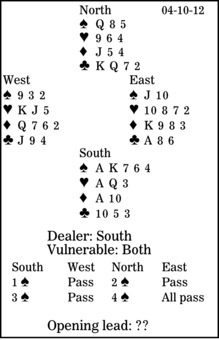 Yes, South should have rebid two no-trump (and reached a makeable three no-trump), or three clubs, a help-suit game-try (and still got to four spades). If the trumps were 4-1, it would be a good moment to make a penalty double, but the distribution looks more docile. East-West should just hope that the contract doesn't make. The safest lead is surely a trump (as it often is when you wish to defend passively). And after that start, declarer should go down.